On April 2 the U.S. Mint published a report that showed that sales of their Gold Eagle coins fell to their lowest amount ever for the month of March despite the fact that gold buying globally was quite strong and on the rise. Sales in March of U.S. Mint American Eagle gold fell to their lowest for the month, and silver coins dropped to their lowest in 11 years, government data showed. Sales of U.S. Mint American Eagle gold coins fell to their slowest March sales ever, according to records dating back to 2007, while silver coin sales for March fell to their lowest in 11 years, government data showed. Sales of American Eagle gold coins totaled 3,500 ounces in March, down 36.3 percent from 5,500 coins in the previous month, according to U.S. Mint data released on March 30. However on the flip side, sales of many gold backed cryptocurrencies along with the paper traded GLD ETF saw increases in March. 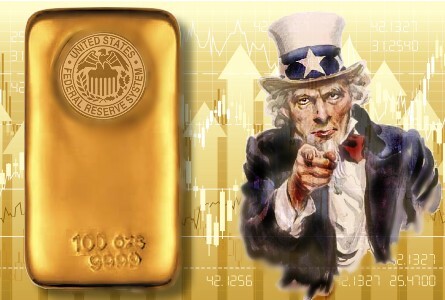 The SPDR Gold Trust ETF (GLD) rose $0.87 (+0.69%) in premarket trading Monday. Year-to-date, GLD has gained 2.01%, versus a 2.94% rise in the benchmark S&P 500 index during the same period. So the question then to ask is, why has the paradigm shifted from physical ownership of assets to instead owning a 'claim' on an asset through paper contracts? The answer may lie in the fact that society itself is becoming more virtualized in our everyday lives, and that people are becoming less interested in real life things, or in reality itself. Over the weekend a best selling book turned movie came out in the theaters which showed a future world where people spent more time in a virtual reality simulation than they did in the real world. And here in 2018 we are already seeing the beginnings of this trend through the fact that social media has supplanted a large portion of human contact and relationships, and even where video gaming has taken over physical activities like sports and recreation. So with this in mind, businesses and companies dedicated to the gold space are quickly engineering their models to accommodate and even attract a public that no longer wants the responsibilities and burdens of physically holding precious metals, but instead desires to own them 'virtually' through paper contracts or cryptocurrencies. Several generations today cannot relate to, or understand the value of a physical gold or silver coin (see Mark Dice video below), but they do recognize the value and potential of cryptocurrencies and video game gold (virtual money). And it is with this premise that companies that deal in gold and silver may find growth in the future for their products by marketing them as a cryptocurrency rather than as a material good.